THERE is a fine line to be drawn when it comes to protecting the well-being of NUJ members, including the issue of salary negotiations, when, every year, chapels and individuals raise their hopes and pass on their aspirations for a decent pay deal. While it be would be fair to say that, in recent years, a number of media companies have dashed those hopes and aspirations from a great height, there have been some crumbs of comfort, at least when you consider the current economics of the newspaper industry. 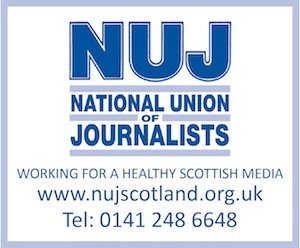 It’s not much but it’s something that the NUJ chapel at Media Scotland – publishers of the Daily Record, Sunday Mail and several Scots local newspapers – has been able to accept a maximum two per cent pay offer. And those publishers who have engaged in meaningful negotiation to try and address pay anomalies among staff or move basic trainee rates up have also to be commended. At least some are taking on board the NUJ demands for fairer pay structures. But in one or two cases, any pay structure at all would do. In my view, there is no doubt that there is a clear correlation between the decline of our newspaper industry – in particular, cuts in staffing levels – and quality. Journalists and the profession of journalism needs to be given much more respect and recognition of our role within society. Instead of using young journalists, in particular, to shovel copy onto pages, proprietors need to give more support in staffing levels and salaries to enable these talented people to deliver quality products that will help drive up circulations again. Of course, it is not quite as simple as that, but there are definite strategies of how staff are treated which have been proven to bring the best out of skilled workers. Unfortunately, the arrival of 2013 has not filled me with too much hope that there is going to be a turnaround in fortunes and, despite my best efforts to remain upbeat and constructive, I do have major concerns as to what might lie in store this year. There is so much ‘fire-fighting’ for NUJ staff, particularly against redundancies. But a lot of our efforts will be going into developing a more positive approach and we are setting targets for our training project to increase and develop a number of interesting initiatives. One of these targets includes the development of modern apprenticeships within the Scottish media, something which employers have shown much support for and there is hope of a proper partnership approach paying dividends to allow substantial funding which could encourage much-needed jobs and appointments in the near future. To help improve the situation one of the essential requirements is for employers and the union to work together to avoid redundancies and reduce stress levels through better ways of working. And rewarding hard-pressed workforces who are committed to a better Scottish media but need to reap more of the benefits due their efforts. Paul Holleran is the Scottish Organiser of the National Union of Journalists.